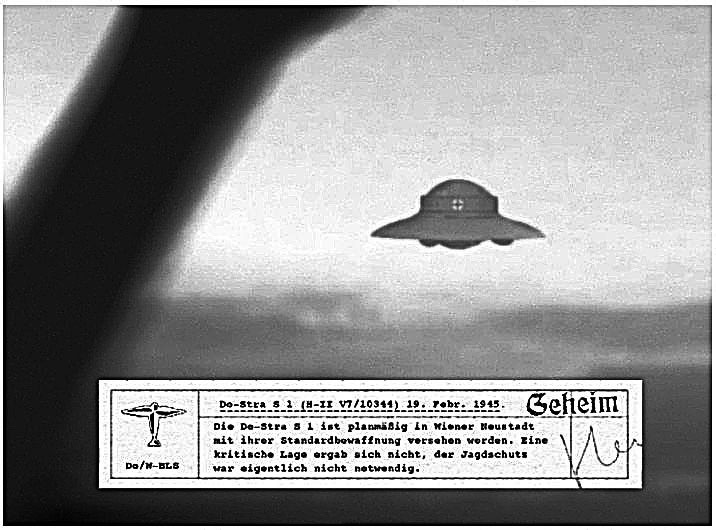 Thirteen years before Hitler came to power the Nazi party or NSDAP began the first experiments in developing the flying disc, or what would more commonly be called the flying saucer. The project became a relentless pursuit to develop an anti-gravitational vehicle that could be mobilized for war. The NSDAP was founded by the Thule Society along with other occult groups of the 1920’s & were essentially the precursor to the Nazi Party. They were in part an extremist right wing faction who’s ranks comprised the elite of German high society. Among its members were Dietrich Eckart, a central figure in Hitler’s entourage during 1919-1923, and who introduced the phrase Deutschland erwache!, Rudolf Hess, & Alfred Rosenberg, the Nazi ‘philosopher. The objectives of the society embraced especially the concepts of racial superiority & embellished their doctrine with occult symbolism & ritual not unlike the early alchemists of medieval Europe. In 1922 the first inter-dimensional flight machine was built in disc form. When Hitler became chancellor of Germany in 1933 the Thule Society received full State backing & continued their metaphysical experiments under a flying disc programme. These began with the round Aircraft series of discs that used levitators developed by W.O. Schumann of the technical University of Munich. The first of these round aircraft were built in 1934 which preceded 2 highly advanced programmes overseen by the S.S. technical branch unit controlled by Himmler’s S.S. 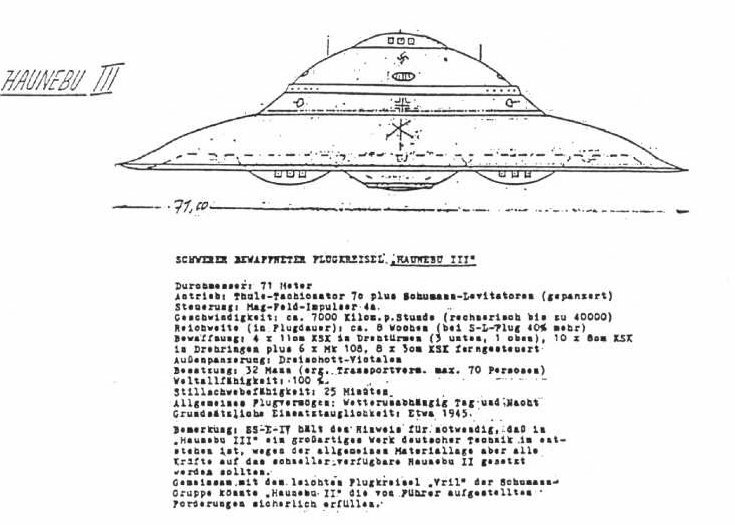 They worked on disc designs that used electro-magnetic gravitic drive systems developed by the Thule-Vril. These propulsion systems relied on the inventions of Hans Coler, Tesla, & Van De Graaf, & utilised a free energy converter coupled to a band generator & vortex dynamo. Collectively these arrays generated powerful electro-magnetic fields that manipulated gravity, but the inventions proved impractical to develop into weapons & they could not be utilised in the war. Undaunted, the S.S. pursued an aggressive regimen of theft, coercion, & forced co-operation spurred on by their successes & the increased allied bombing campaigns that made conventional take-off & landing of craft impractical. The S.S. was a state within a state, within its own production facilities, materials, technicians, work force & secrets of Nazi military bases outside Germany, where these discs were stored. They raided patent offices all across occupied Europe & arrested , blackmailed & coerced aeronautical personnel into participating in their programmes. The S.S. also employed large slave labor forces to construct large underground facilities & the manufacture of components for these machines. Because of relentless allied bombing the S.S. were pushed into the development of new radical technologies such as Viktor Schauberger’s liquid vortex technology engine which he developed while in custody; Rudolf Schriever’s flying gyro that used conventional jet engines; and BMW’s Fluglerad 11 V2. In 1940 Paris, Henry Coanda was arrested & forced to work on the lenticular disc of his own design but it was too large & like the Omega Diskus invented by Andreas Epps, never got passed the testing phase. 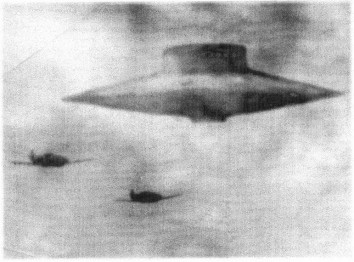 The first saucer, the Miethe disc utilizing Schauberger’s liquid vortex engine took flight in 1944. This paved the way for the privately backed A.S.1 circular flying wing invented by Arthur Sack, that evolved into the A.S. 5 & A.S. 6 but these were plagued by construction problems & were scraped. The Feuerball, an unmanned interceptor disc were launched in response to allied bombing. They relied on a rocket motor for launch , a plume sensor for aerial detection, & an electrostatic field weapon. The disc burned chemicals around its ring to create an electrostatic field that disabled allied bomber engines & radar. The iridescent glow generated by the electro-static field earned these discs the title Foo Fighter by the Allies, that ranged from small to large in size & attacked individually or in groups. the Feuerball was soon joined by an upgraded weapon called Kugelblitz or Ball lightning developed by Zeppelin Werk & haunted the skies from 1944 -1945. But by the Spring of 1945 the war was lost & work on the discs was halted. BMW destroyed all of their saucer craft however, along with Miethe & his disc, most of the S.S. scientific branch records fell into the hands of the British & taken to AVRO Canada where with the help of the Americans attempted to recreate a working model. The flying saucer resurfaced in late 1945-46 with the Horten brothers who were experts in circular wing design & worked for the U.S. government. It was The Horten brothers who are believed to have created the parabolic lifting body carried by a large meteorological balloon that crashed in Roswell in 1947. The feuerball attacks that ended in April in Germany continued over Japan in August the same year, via technology transferred by U-boat to Japan. but the Japanese were distrustful of the technology & all but abandoned & destroyed them. But that is not the end of the S.S. technical branch Unit E-IV & their disc programme. Although many of the flying discs were destroyed & their laboratories flooded by the S.S. many more went missing. None of the original Thule-Vril discs were ever recovered, neither were the Haunebu 11 or Vril 7 discs. These craft along with the Vril 8 Odin & the more advanced Vril-9 Abjager were moved somewhere safe from Allied bombing & capture. 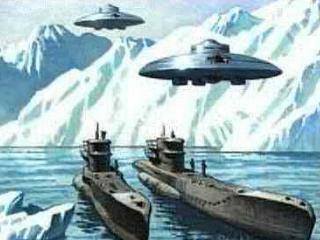 The technology was evacuated to a secret base in Antarctica under S.S. General Kammler, who was in charge of Germany’s secret weapons programme. The year before WW2 Germany sent an expedition to Antarctica, to scout out locations for military bases, where they established Neu Schabenland in the former Queen Maud Land. Hot internal springs were found there, rich iron ore deposits, & vegetation. An underground fortress was created with the help of slave laborers deep beneath the Hoffman mountains. Base 211, & access was granted via an underwater trench that ran the length & breadth of the area. Throughout the war German U-boats made frequent trips to the South Atlantic, South America & Antarctica. Meteorological buoys were also set up in Antarctic waters & weather stations on islands located near Antarctica & the southern tip of South America. In 1942 the German Race & Settlement Bureau began the transportation of 10,000 Ukranian women of Aryan decent to Base 211, along with 2,500 S.S. Soldiers for colonisation, & the continued development of the Thule-Vril Saucer programme. By 1946 it became apparent that 54 U-boats & over 6,000 technicians & scientists were missing from Germany, most of these from the S.S. Technical Branch. 40,000 slave laborers & 142,000-250,000 german citizens had disappeared. Washington, under the cover of hunting Nazi war criminals launched a South American version of Operation Paperclip in search of the missing scientists & their technology. High-jump headed by Admiral Byrd. The task force conducted aerial reconnaissance dropping magnetometers to detect any anomalies under the ice. If a base was found 4,700 armed troops were standing by to either capture or destroy it. But after several encounters with what Byrd described as “enemy aircraft that could fly from pole to pole at incredible speed”, & the loss of several of his planes Byrd returned home, with operation High-jump a failure.